To prepare for Easter we looked at taking our identity from Christ. To prepare for Easter we looked holding the things of life that manifest meaning loosely. To prepare for Easter we looked at acknowledging that contentment only comes with Jesus’ life. In the resurrection our identity in the life of Jesus is secure, he conquered death. In the resurrection (John 20) the things that provide meaning in life become grounded in his abundant life. In the resurrection contentment is possible because his life extends beyond our living. All humanity is enjoying our first birth. Without being born, we would not be alive (duh!). To experience Jesus’ resurrection life we need to be born again. That is what it means to be “saved”. We trust that Jesus died on the cross for our sins. On Good Friday we looked at the development of the “curse” in Deuteronomy, which Paul, in Galatians 3 says Jesus took on himself for us. This salvation is God’s free gift of grace. Aren’t we glad that we never move beyond this grace. In fact before God created anything, his plan was to share his grace to forgive our sins. His plan was to share his grace by giving us a path to walk on in this life. God had “prepared beforehand” his path for us to experience his life. Is there a bigger insult to our great God then to not be content with the path he has for us? The disciples ran while he was on the cross. They were terrified in the upper room Easter evening. They we in desperate need for restoration. The sustainability of Jesus grace is the path he created for us. We take our identity from being his “workmanship”. 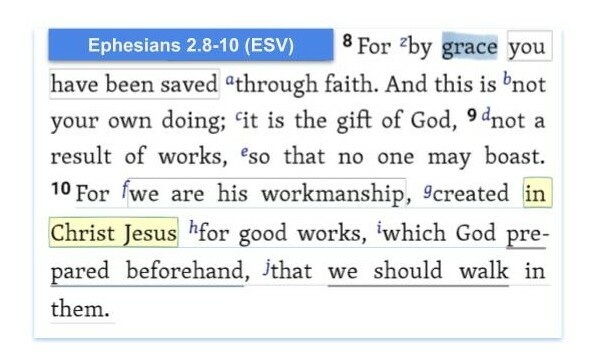 We acknowledge that meaning is a grace gift from him. Contentment is our experience him as our peace. Accordingly, a few weeks we will stay in John’s gospel to see how Jesus restores the disciples peace and prepares us to walk in his grace. This entry was posted in Devotional Thought, Discipleship, Jesus Focus, Lent, Living in Grace, Sermon Series. Bookmark the permalink.